Keep a spray bottle handy containing water and / or your favourite moisturising ingredients to spritz and re-moisturise as needed. There has been some debate going on weather oils really do seal moisture into the hair or whether it’s just a myth. From my experience I can attest that oils and butters really work. If you find that they are too heavy for your strands during the Summer, try switching to a lighter one. If you’ve mainly been using butters during the Winter, opt for an oil like avocado or olive oil during the Summer. Or if you’ve been using heavier oils during the Winter, switch to a lighter one for the Summer, like argan, coconut or sweet almond oil. If this is still too heavy for you, then just apply a light oil to the ends of your hair, where moisture is most likely to escape from first. Some say that applying gels over your leave-in conditioner can also seal in moisture. I’ve never used gel as a sealant, but go ahead and give it a try to see if this works for you. Rinsing your hair with cold water after you’ve washed it and applying cold products from the fridge will encourage the cuticle to close, which ensures shinier and moisturised hair for longer. As much as I love wearing my hair down during the Summer there are some days that it’s honestly just too hot to have all my hair out around my face. For those days I plan to wear simple low manipulation up-do styles. Some of my current styles include the high and low bun, the puff and the roll and tuck up-do. Goddess braids is a style I’d like to try as I think it’s ultra chic, feminine and perfect for hot Summer days. Add a cute flower or headband and you’ll be good to go. The easiest way to do this is to wear hats and scarves. I love this method as it creates a direct barrier between your strands and the harsh drying effects of the sun. Of course the fact that hats and scarves add a completely new dimension to your look is an added bonus. Hair that is already wet from tap water is less likely to absorb more water, which will help it to absorb less chlorinated / sea water. Once sea water has dried on the hair it can have a drying effect as it draws moisture out of the hair. As unstylish as it might feel, consider wearing a swimming cap if you’re going to be spending lots of time in the water, especially chlorinated water as is can be very damaging. Rinse the chlorinated / sea water out of your hair as soon as you’ve had enough water play for the day. Those nights when it’s so hot that you can’t bear the thought of wearing a scarf / bonnet to bed, simply prep your hair for the night as you usually would and sleep on a satin pillowcase only, foregoing the scarf / bonnet. You’ll be a lot more comfortable. Generally I struggle to drink a perfect 8 glasses of water a day, and with Summer comes the added cocktail hour every day, which can cause dehydration. But since I’m placing a huge focus on keeping healthy throughout the Summer I plan to hydrate myself from the inside too. The advice I’ve come across is to drink 1 glass of water for every alcoholic drink. This will help to ensure healthy tresses from the inside out. 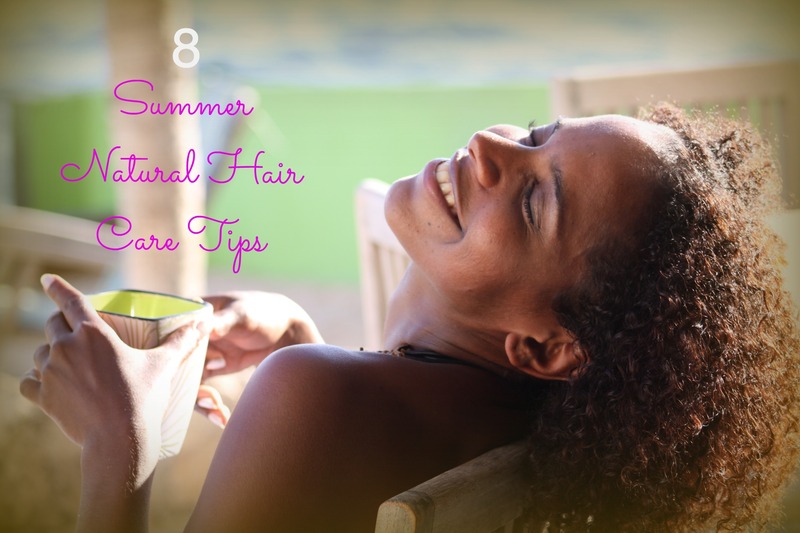 What are some of the ways that you protect your hair during the Summer? P.S. Next week I plan to write a piece for all my curly girls in the southern hemisphere on Winter hair care, especially for those in South Africa where it’s cold as @#$% right now. So make sure you check back over here during the course of the week. It’s great – thank you! great read!! thanks for the tips! this will be my first summer in years rocking my natural curls!! Thanks for these tips!!! So encouraging to me, since I’m a newby. I really hope they can help you in some way on your new journey. Thanks so much for reading.